WHAT IS OMNILUX™ COMBINATION LIGHT THERAPY? OMNILUX™ is a medical device that utilizes light emitting diode (LED) technology. Using visible red LEDs and invisible near infrared LEDs, OMNILUX™ works with the body’s own natural processes to counteract the effect of skin aging. As we grow older, the cells that manufacture the skin’s supportive structures begin to slow down. Environmental damage from the sun’s rays speed up this process and produce free radicals that damage the skin and cells that produce collagen and elastin. OMNILUX™ Combination Light Therapy targets specific cells which are responsible for the synthesis and repair of the skin’s supportive structures, leading to a softening of fine lines improved skin tone. 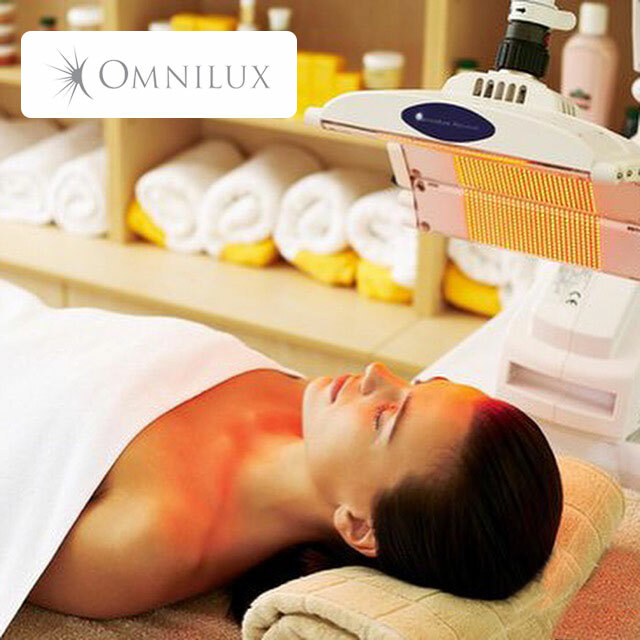 Who can benefit from the OMNILUX™ Combination Light Therapy treatment? This treatment is beneficial and effective for both men women of all ages and skin types. All makeup and/or sunscreen will be removed thoroughly before the treatment. Safety eye wear will be provided to you during treatment sessions, as the light be positioned close to your face. Each treatment session will take approximately 20 minutes. You will experience a feeling of relaxation and well-being during and after the treatment. Following your 20-minute session, you can go right back to your normal routine. The initial effects you will see are a clearer, brighter and smoother complexion. After the course of treatments you will begin to notice an improvement in tone, clarity and texture. Studies have shown over 80% of subjects reported a softening of fine lines, and 75% reported improvement in skin softness and smoothness. Unlike other treatments, where the effects are short lived, OMNILUX™ Combination Light Therapy stimulates natural cellular processes that rejuvenate and repair the skin. Thus, the results you see with OMNILUX™ continue to improve for up to 4 to 6 months after a course of light treatments.